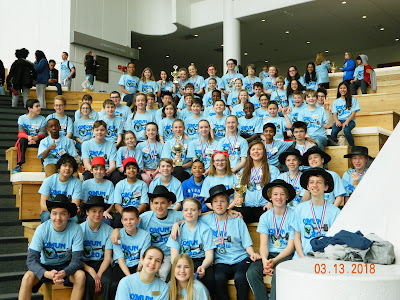 On Sunday, March 11, the Wyoming Middle School (WMS) Model United Nations team ventured to Columbus to participate in the Ohio Model United Nations (UN) conference. School advisors, Nick Allen and Lisa Nocks, joined with eleven parent chaperones in leading 66 students from sixth, seventh, and eighth grade. When they arrived in Columbus, Wyoming students united with 1,200 other middle school students from across the state of Ohio. Of the 152 member nations present, WMS students represented eleven nations. Our students had the opportunity to present their resolutions and engage in rigorous debate, while representing the viewpoints of their nations. 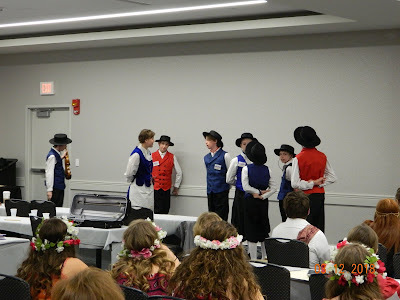 They also shared their understanding of the culture of their chosen nation through the arts, either by acting out a folk tale, sharing a cultural dance or performing traditional music. In addition, our students participated in writing contests where they were challenged to address world issues, define what it means to be citizen of the world, and to peacefully resolve conflict. Our students were recognized throughout the entire conference for their thoughtful debate, well written resolutions, and unique representations of culture. Of the 152 nations represented, 10 nations are recognized for having an outstanding resolution. Students representing the nations of Rwanda (Annie Fairweather, Kayla Geller, Marc Chow, Olive Hester, Sophie Chow, and Spencer Bowden) and Australia (Ajay Iyer, Ava Johnson, Lauren Hudepohl, Maggie Broderick, Michael Polsinelli, Natalie Barth, and Sylvia Maloney-Noyes) were acknowledged with the award for Outstanding Resolution. Rwanda's resolution proposed farming insects as a way to help solve world hunger, and Australia's resolution suggested regenerating coral reefs by planting baby coral grown in labs. The nation of Norway (Cal McCullumsmith, Cullen Batsel, Ethan Hatcher, Jack Cavanaugh, Kylene Chu, Sam Elliott, Thomas Zidarescu, and Van Carmichael) were runner-up for their presentation of traditional folk music and dance. Kayla Geller was recognized with top honors for her essay on World Citizenship. And, Liam O'Shaughnessy was one of 10 students, out 1,200 middle schoolers, to be recognized as an Outstanding Delegate. All of the WMS teams did an outstanding job in representing themselves, their school, our community, and their UN member nation. Great job students! 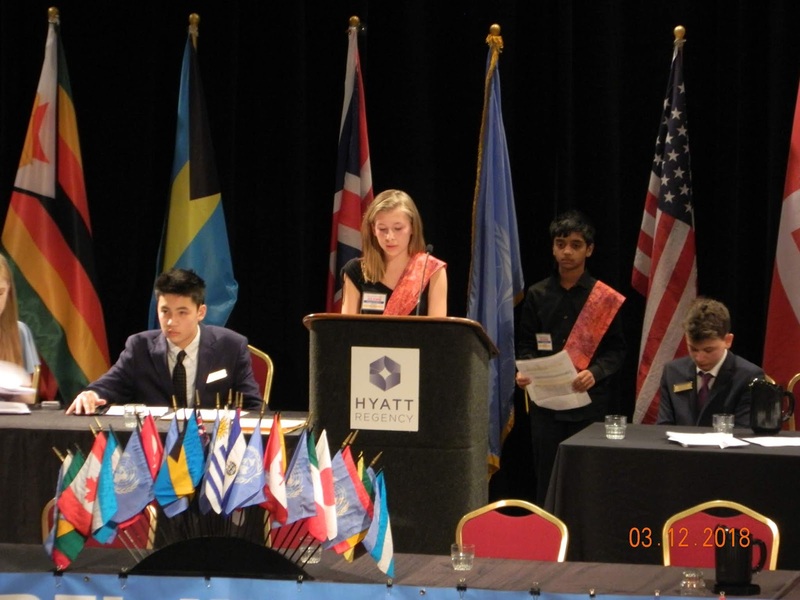 Wyoming Middle School had 66 students participate in the Ohio Model United Nations Conference. Liam O’Shaughnessy was recognized as an Outstanding Delegate. 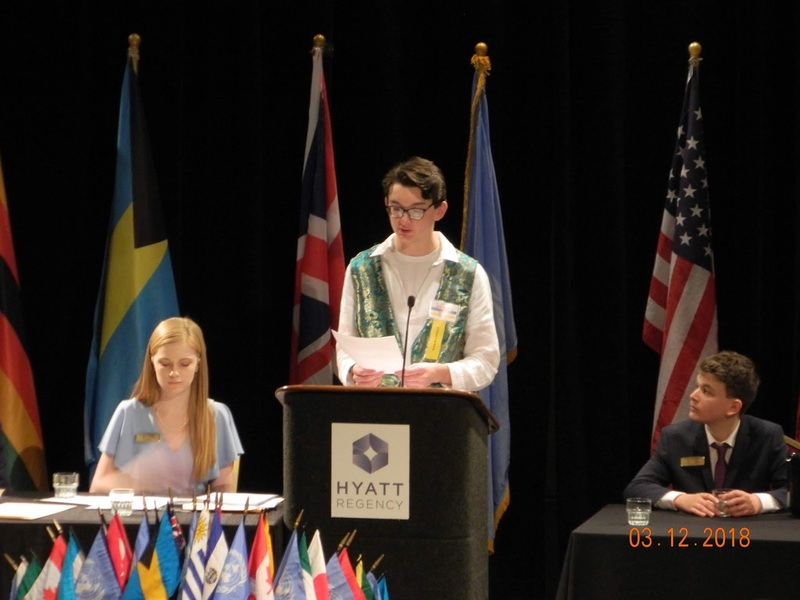 Maggie Broderick presented her Australian team’s resolution at the General Assembly. The nation of Rwanda received the award for Outstanding Resolution. These sixth graders represented the nation of Belarus. The team representing Mozambique was ready for the sessions. The Estonia team was all smiles in the early evening session. The team from Norway performed a traditional dance for the talent portion of the convention, earning them the runner-up placement out of 152 nations.